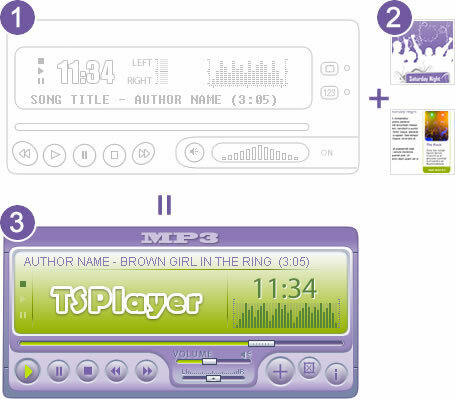 A music player - a 100% adaptable to a specific Web site design - may be built with our visual interfaces by selecting the desired visual environment. A unique special design may also be ordered for your Web site. We warrant the exclusivity in the player visual design that will make your website a unique product. 1Our base skin with all functionalities. 3The custom skin adjusted to your web page. The information you give will serve as a guideline for designers of the visual environment you need and expect. Based on this information, two different visual solutions will be shown within the time arranged, considering the complexity of the design. The selected design will go through as many as three revisions before the elaboration of the final product (the player skin). Service CostWe offer two main services: The first one covers a 100% personalized and a unique design. The second one covers only basic modifications to an existing skin. The service fee can be as low as us$25.00. $149.00The complete service. Creation of a new skin 100% adjusted to your website. $25.00The reduced service includes only simple changes to an existing skin. If you don't see, amongst our skins, the one that matches best your website's design, or if you wish to modify any of our existing designs to achieve a total match with your website, we offer a custom design service and implementation of personalized skins. Display on your webpage a unique product that identifies you. Be sure to type it correctly so we can sent back the reply. Send us your requirements and the information that we will use as guideline. Notice: A visual environment (skin) development will be completed after the payment is made by the client, and in any case you are not satisfied with the final product, we will refund the 85% of the payment.